Vardø gets its name from the words wolf and island. On "wolf island" people have lived for over a thousand years. At all times, the rich natural resources of the outer Varangerfjord have created the basis of life for people. 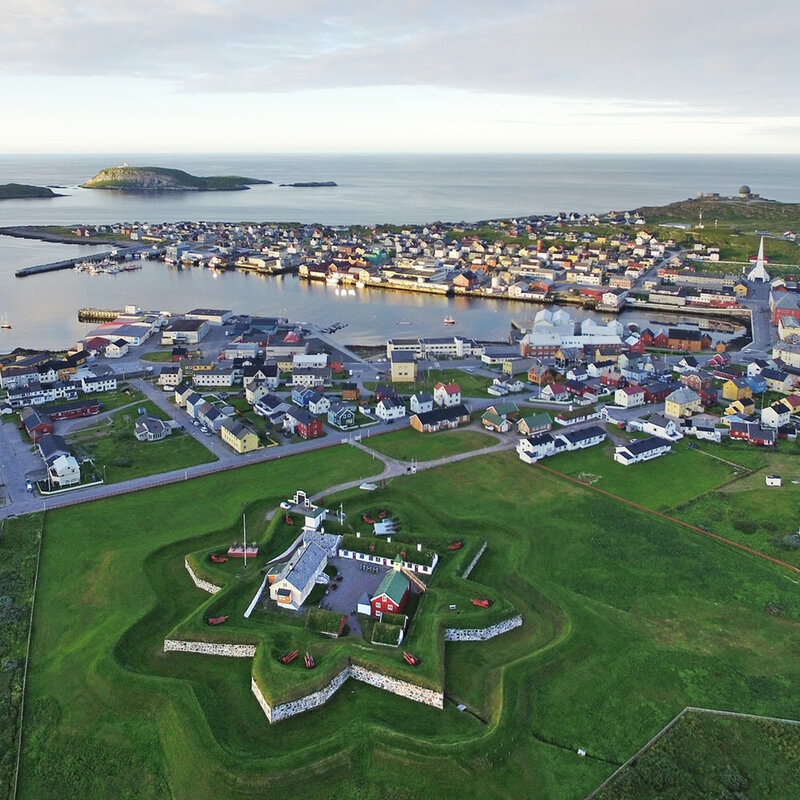 Vardø is Norway's northeasternmost city, and the only one in the Arctic climate zone. In a cold and stormy climate, in the midst of spectacular Arctic nature, you meet open minded and generous people. Vardø is famous for its festivals, street art and snowball fights, winter storms and midnight sun, birdlife and fishing. Vardø is a place of contrast. A visit to the end of Norway is also more accessible than you may think. Several flights a day arrive at Svartnes Airport, and from there it is only 5 minutes to Vardø town, where everything from dining, cultural and natural experiences await you. Aerial view of Vardø town. Town hall and cultural centre in the center. Behind is Vardø harbour. To the right is Reinøya and Hornøya. Visit Vardø is Vardø's online tourist information. 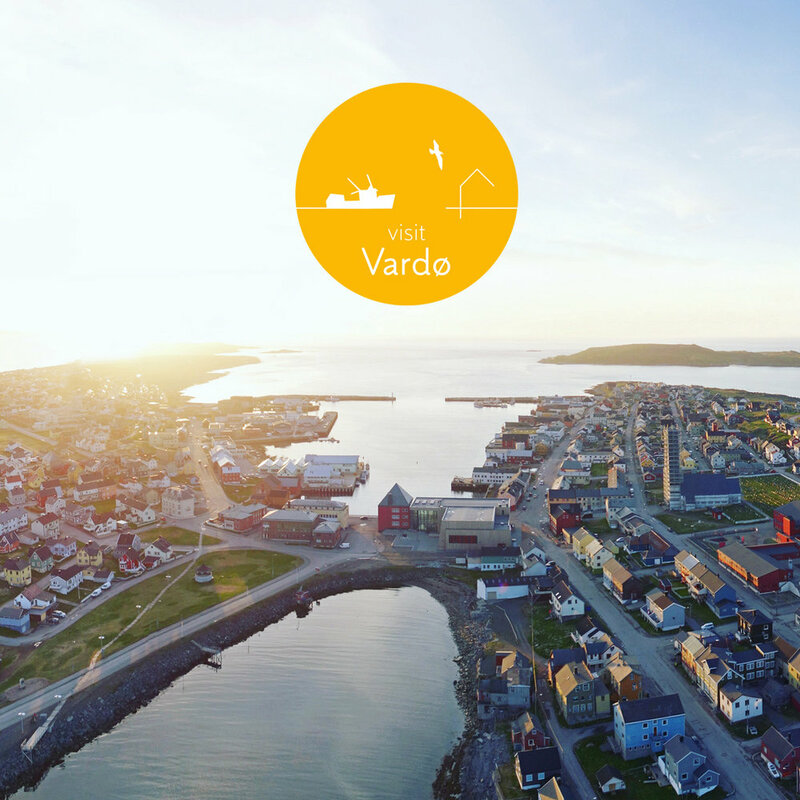 Throughout Vardø chamber of commerce, an entire business community has taken the initiative to present all the cool, beautiful and inspiring things Vardø has to offer. Vardø's long history consists of ups and downs. Around the 2000s, Vardø's society has experienced a lot of hardship and relocation, because of a collapse in the fishing industry. However, after many years of adversity, the negative trend has reversed: Both Vardø’s population itself and, not least, a large international audience have fallen for this windy, colourful, complex, ice-cold and warm-hearted city in the northeastern part of Norway. A new optimism prevails, and Vardø is on its way up! Tourism creates new jobs and a number of exciting projects and initiatives help promote business and prosperity. Vardø is the city you just have to visit! Hornøya bird cliff outside Vardø is one of Europe's hottest natural attractions. Vardøhus Fortress is the northernmost fortress in the world. The first fortress was ordered and built by King Håkon V Magnusson and was completed around 1300. The octagonal fortress was built between 1734 and 1738. The fortress is centrally located in Vardø, a stone's throw from the harbour and the hotel, with a great view over Bussesundet and the mainland. In the background of the picture above you see Hornøya bird cliff and lighthouse. Vardø street art. The festival of Komafest resulted in Norway's northeasternmost city also becoming a gallery for street art of the very best kind. A city walk in Vardø is a study of contrasts, history, art, nature and coastal culture all intertwined. On the website vardorestored.com you will find lots of information about the innovative and exciting cultural heritage projects in Vardø. It is the Varanger Museum that is behind this exciting venture. Varanger Museum is also open at the Pomor Museum and guided tours are available. Vardø is primarily a fishing community. Fishing is the main business in Vardø and although the coastal fleet in Vardø is small compared to earlier times, the fishing boats that go in and out of Vardø harbour are an intrinsic part of the city. Vardø in the midnight sun. Vardø town seen from Hornøya. Vardø in March: Hornøya is alive with birds and the colorfull city in the snowy Arctic landscape must be experienced. 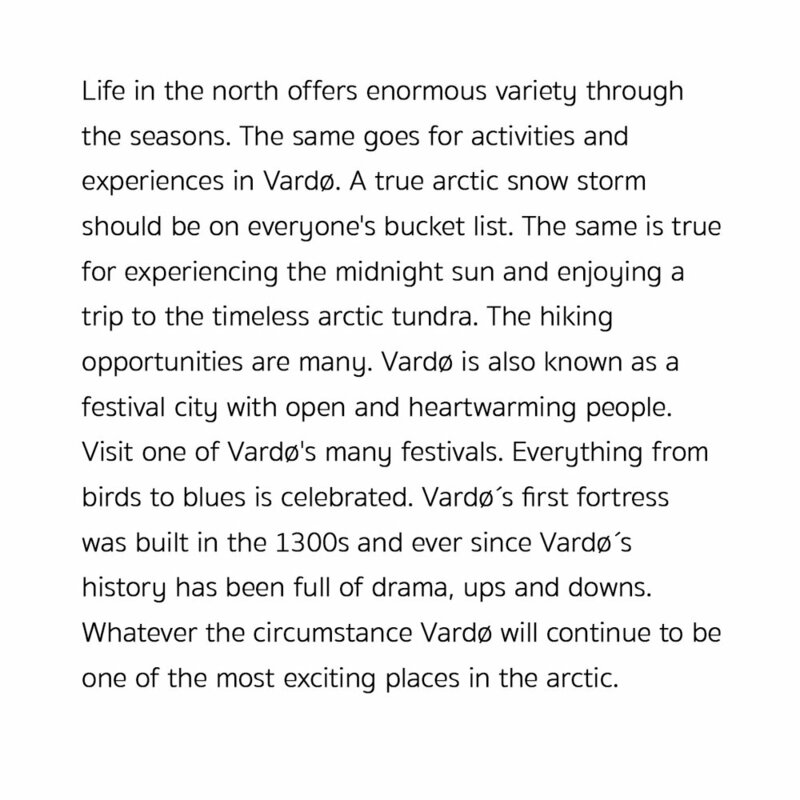 The website Visit Vardø is made by Biotope for Vardø Chamber of Commerce. For questions or suggestions contact Vardø Chamber of Commerce on mail post@vardonf.no or join us on our Facebook page.